What difference would it make in your life if you had an absolutely unshakable confidence in your ability to achieve anything you really put your mind to? She wrote that, up to that time, this was a question she had never even dared to consider, but now, she thought of nothing else. She had realized, in a great, blinding flash of clarity, that the main thing separating her from her hopes and dreams was the belief in her ability to achieve them. Most of us are like this for most of our lives. There are many things that we want to be, and have and do, but we hold back. We are unsure because we lack the confidence necessary to step out in faith in the direction of our dreams. Just think: What difference would it make in your life if you had an absolutely unshakable confidence in your ability to achieve anything you really put your mind to? What would you want and wish and hope for? What would you dare to dream if you believed in yourself with such deep conviction that you had no fears of failure whatsoever? The key is to be true to yourself, to be true to the very best that is in you, and to live your life consistent with your highest values and aspirations. Take some time to think about who you are and what you believe in and what is important to you. Decide that you will never compromise your integrity by trying to be or say or feel something that is not true for you. Have the courage to accept yourself as you really are-not as you might be, or as someone else thinks you should be-and know that, taking everything into consideration, you are a pretty good person. Being true to yourself means knowing exactly what you want and having a plan to achieve it. Lasting self-confidence comes when you absolutely know that you have the capacity to get from where you are to wherever you want to go. You are behind the wheel of your life. You are the architect of your destiny and the master of your fate. Act as though it were impossible to fail. Act as though you already had a high level of self-confidence. And continually ask yourself, “What one great thing would I dare to dream if I knew I could not fail?” Whatever your answer, you can have it if you can dream it, and if you have the self-confidence to go out and get it. Here are three steps you can take immediately to put these ideas into action. First, resolve to step out in faith in the direction of your dreams; just do it! Third, be true to yourself, to the very best that is in you. Never compromise! 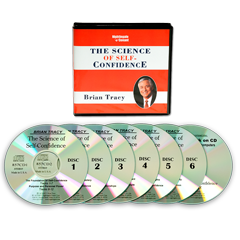 Click here for more information on The Science of Self-Confidence. To learn more about how to achieve optimum confidence, take a look at my recent post Be The Best You: 7 Keys To A Positive Personality.